Greenberg was a superstar high school athlete who lettered in baseball, basketball, and soccer. He was the first player in Connecticut history to be named to four different all-state teams. After a successful baseball career at the University of North Carolina, he was selected by the Chicago Cubs in the ninth round of the 2002 draft. On July 9, 2005, with the very first pitch of his very first major league plate appearance, Greenberg was beaned in the back of the head with a fastball thrown by Florida Marlins reliever Valerio de los Santos. He suffered severe headaches for months and sustained permanent positional vertigo. His attempt to return to the big leagues was initially unsuccessful, and he bounced around the minor leagues until washing out into independent league baseball. While playing for the Bridgeport Bluefish in 2011, he even had the opportunity to face Valerio de los Santos again, and he singled in his first meeting against him. In 2012, an online petition sought to return Greenberg to the major leagues and secure him at least one official major league at-bat. The Miami Marlins ultimately signed him to a one-day contract. He entered a game against the New York Mets as a pinch-hitter in the bottom of the sixth inning, but struck out on three knuckleballs, courtesy of eventual Cy Young Award winner R.A. Dickey. 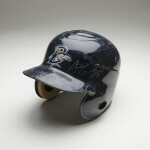 He was subsequently signed to a minor league contract by the Baltimore Orioles, but was released before the season. He played one final year of independent league baseball and retired.